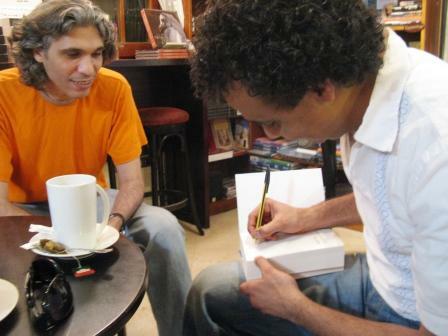 Khaled signing his book at Kotob Khan. There’s a lot in the public domain about our friend Khaled al-Berry, as his memoir of his adolescent years—Life is More Beautiful than Paradise—is available both in Arabic and in English (translated by Humphrey Davies). Al-Berry, who currently lives in London and works for the BBC, grew up in Assyut, Upper Egypt. His memoir is quite compelling, not for its “jihadist’s own story,” but for the small details of his life, his successes and failures, his time in prison. There’s really no political juice here, but instead an adolescent boy who wants to fit in, to succeed, to do right. During the course of the memoir, Al-Berry morphs into a jilbab-wearing member of the Jama’a Islamayya, and then changes again, going off to attend medical school at Cairo University (and after joining a long tradition of physician-writers). But, we’ll cut things off here, as our friend al-Berry would prefer to be known not as the former-jihad-boy, but as a novelist. رقصة شرقية is his second novel (it weighs in at nearly 600 pages), and is the story behind the story of an Egyptian killed in Italy on New Year’s Eve 2006. Previously profiled: Egyptian Miral al-Tahawy, longlisted for her Brooklyn Heights, Bensalam Himmich, for My Tormentor, Fawaz Haddad, for God’s Soldiers, Khairy Shalaby, for Istasia, Raja Alem for The Doves’ Necklace, ﻿Renee Hayek for A Short Life﻿, Waciny Laredj for The Andalucian House, Maha Hassan for Secret Rope, Mohammad Achaari for The Arch and the Butterfly, and Maqbul Moussa Al-Alawi for Turmoil in Jeddah. Re. raqs sharqi. How ’bout belly dance? That’s what it’s called in these parts (the USA), where it has really taken off as an artistic exercise form. A much more inviting title — to me at least — than Oriental dance would be.